Today was just one of those days–you know, when rather predictable, mundane chores turn into something else again. I started the day by driving into Palmer for an appointment, but was met at the door by the office manager who told me that it had been cancelled, as the physical therapist thought we were finished. Well, OK, that left more time to get into Anchorage for my afternoon appointment and a bike ride. So Tom and I loaded up the bikes in anticipation of a spin along the Tony Knowles Coastal Trail, always a favorite of ours. However, the state troopers had other ideas. Seems they had the highway closed for HOURS, chasing a bad guy between Palmer and Anchorage. We cooled our heels in standstill traffic for over an hour before we could exit and turn toward home. I just couldn’t stand wasting the day however, so I had Tom drop me back in Palmer, where I changed into bike togs and hit the road. One of my favorite rides is around Farm Loop Road. There are several Community Supported Agriculture farms on this route; you know, where you buy a “share” and get a box of produce each week, allowing you to feast on whatever is in season. 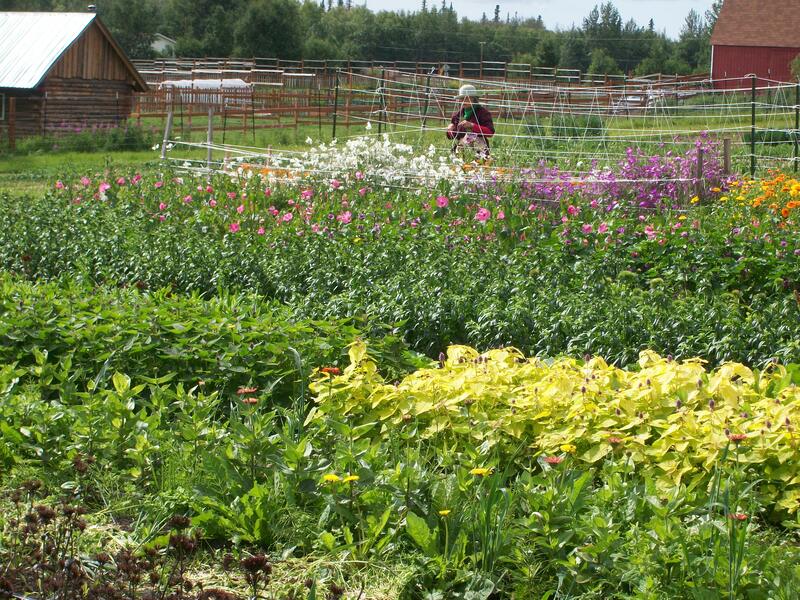 There are also several nurseries and greenhouses here–Palmer is the premier agricultural area in our Southcentral region. Here we combine two-to eight-foot topsoils with 19.5 hours of daylight in the height of summer to spectacular effect. 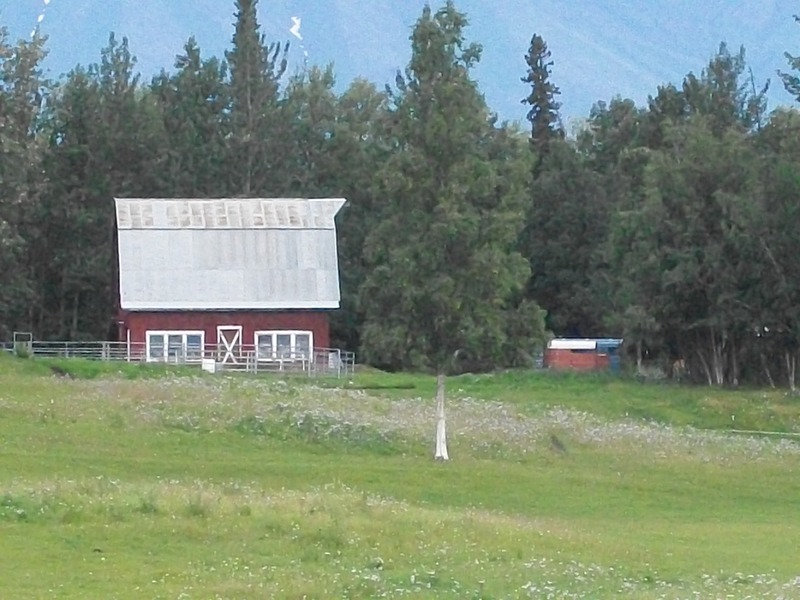 There are hundreds of acres of flowers, vegetables and hay grown here in the Mat-Su Valley, and I am very fond of telling my guests on the train all about the agricultural colony that was established during the Depression in 1935 in Palmer. Part of the New Deal, it aimed to settle the country, showcase Alaska as capable of supporting farms, and assist struggling farmers from northern states like Minnesota, Wisconsin, Michigan. Such a sweet little Colony barn. There are still some fine examples of period homes and barns, like the one to the right here, still in existence. And though only about 20 percent of those relocated farmers were still on their land after five years, agriculture is again a staple of the economy here. With the surge in interest in local, organic foods, farming in Palmer is experiencing a renaissance. Even before the “locavore” movement really got rolling you could find locally grown potatoes, carrots, cabbage and greens in the grocery stores. Now there is everything from summer squash to herbs to cheese, milk, meat and eggs available at the farmers’ markets. There is really no excuse for not eating well in the Valley! On the ride home I stopped at the Matanuska River overlook, about 500 feet above that braided-channel, glacier-fed river. Recently, swollen first by melt due to fine weather and then by heavy rains, this river has carved a new channel, chewing through established banks to claim several homes and outbuildings in its relentless rush to the sea. For years I have watched the river’s depredations, swearing that I would never purchase property in its flood plain and ridiculing those who had. Now, all I feel is sympathy for those folks, losing their dirt, their home, their dreams to the iron whim of Nature. 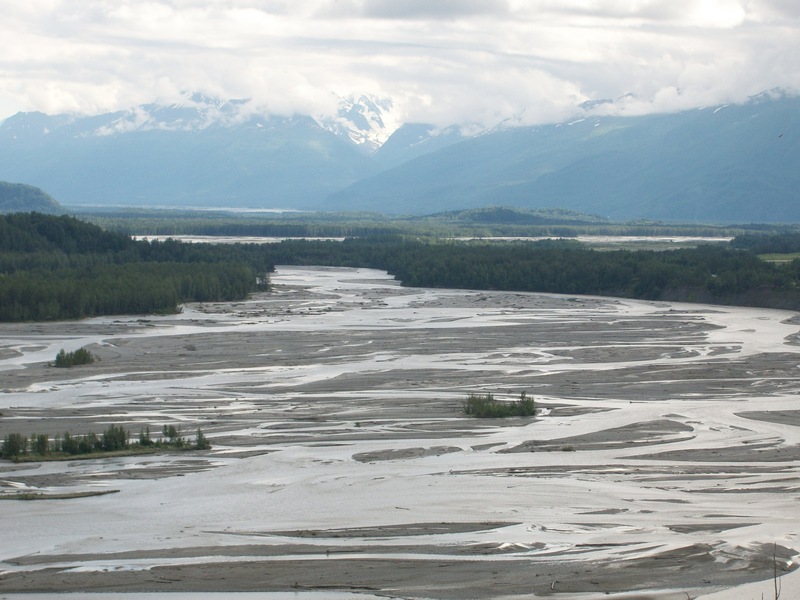 The Matanuska is beautiful, powerful, unpredictable and sometimes grim, reflecting the larger reality of life in the Last Frontier.